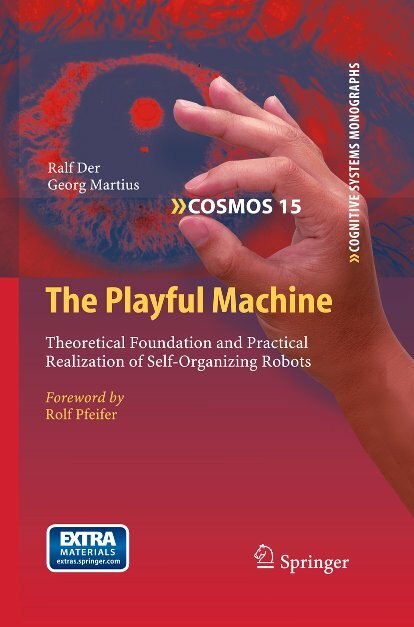 This page contains information about the book "The Playful Machine" by Ralf Der and Georg Martius. You can find here videos and software referenced in the book, see the menu above. We have now a pdf version for download for your personal use. See paper in PNAS (preprint) and videos. For a larger version, see here. The software for the experiments and the forum are now available. Autonomous robots may become our closest companions in the near future. While the technology for physically building such machines is already available today, a problem lies in the generation of the behavior for such complex machines. Nature proposes a solution: young children and higher animals learn to master their complex brain-body systems by playing. Can this be an option for robots? How can a machine be playful? The book provides answers by developing a general principle---homeokinesis, the dynamical symbiosis between brain, body, and environment---that is shown to drive robots to self- determined, individual development in a playful and obviously embodiment- related way: a dog-like robot starts playing with a barrier, eventually jumping or climbing over it; a snakebot develops coiling and jumping modes; humanoids develop climbing behaviors when fallen into a pit, or engage in wrestling-like scenarios when encountering an opponent. The book also develops guided self-organization, a new method that helps to make the playful machines fit for fulfilling tasks in the real world. The book provides two levels of presentation. Students and scientific researchers interested in the field of robotics, self-organization and dynamical systems theory may be satisfied by the in-depth mathematical analysis of the principle, the bootstrapping scenarios, and the emerging behaviors. But the book additionally comes with a robotics simulator inviting also the non- scientific reader to simply enjoy the fabulous world of playful machines by performing the numerous experiments. The Playful Machine 2012, 336 p.
Content: © Copyright 2011, Ralf Der and Georg Martius; Impressum. Parts of the page have been translated from LATEX by HEVEA.